AMS Marine was proud to have been among the Contractors selected to carry out major heat exchanger overhaul and replacement during the Maersk Kentucky's recently concluded Dry Dock Survey at the Sembcorp Marine Yard. During the course of 3 weeks, the AMS team worked tirelessly day and night on the ship's Main Engine and Generator Cooling Systems to ensure operational reliablity and efficiency. Thanks to the good support of co-operation of the highly professional Maersk crew, our team was able to complete all assigned tasks without delay while maintaining our strict Quality and Safety standards. 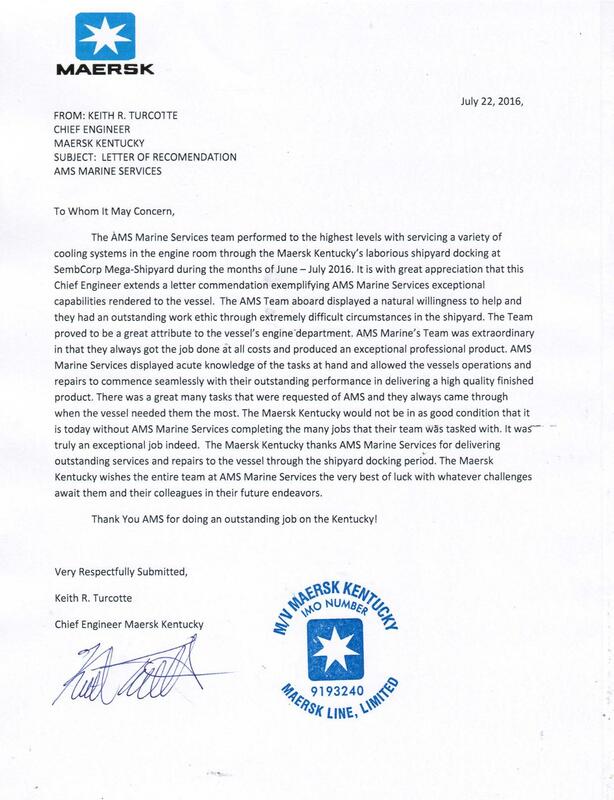 All of us at AMS Marine Group wish the crew and officers of the Maersk Kentucky a hearty Bon Voyage and Safe Sailing!